When the Write as Text field is checked in the Details menu (see below), MediaLab will write the data to the data file with quotes surrounding it. It will also indicate in the SPSS input file that the variable format is text; otherwise, value formats are recorded as numeric. Missing values for items with the Write as Text field checked will also be treated as text format; otherwise missing data values will be recorded as numeric format. 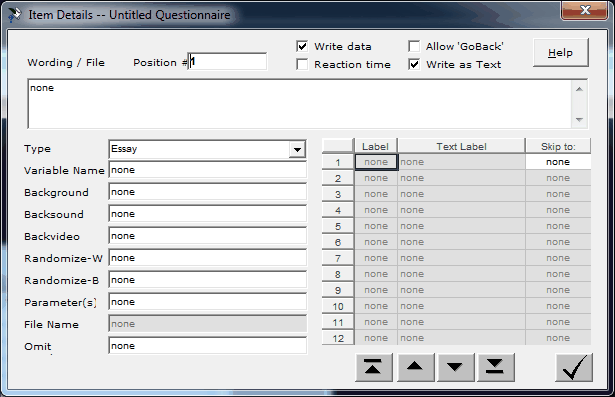 Typically, this option is checked for item types like essay, recall list, and thought listing whose data are primarily text, but it can be used with other item types as well. Also see the Data section of the manual for more details.